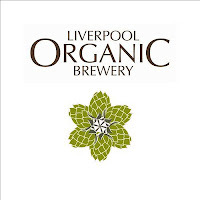 Liverpool Organic Brewery are not only a local brewery to me they are also one of my favourite. Source Deli in Ormskirk sells their excellent bottled range but I don't get to try it on cask that much - for some reason most of the pubs in Ormskirk never seem to have any on. To remedy this situation a few friends and I decided to book on one of their brewery tour days. We arrived last Saturday just before twelve and around twenty to thirty people were hanging around outside waiting for it to start. Doors opened promptly at midday and we filed in, and handed in our tickets (well the group I was with did, I was fortunate enough to have my name on the guest list). We were handed a Product Range booklet and told to collect a branded pint glass (which you can keep if you wish) and approached the bar. Five handpulls were available at a makeshift bar in the middle of the main brewing room served by various members of brewery staff including Paul Burns (deputy head brewer), Ben Topping (logistics) and Ron Kellett (delivery & logistics). That wasn't the only selection, we were informed that there were also five additional casks of different ales in the next room which were gravity-fed and so you could help yourself to those as well. Ten different ales is an excellent choice and they had a great mix of different styles and strengths to really show off what a quality brewery they are. After around 15 minutes I looked around and was amazed - the twenty to thirty people outside was only a small fraction of the total people who had now entered the building, I'm guessing that there were well over one hundred drinkers now in the building! Once there had been time for everyone to have got at least one drink the managing director, Mark Hensby gave us some background about the brewery. They have now been open three and a half years, having originally dreaming up the idea of opening a brewery back in 2008, moving into unit 39 in April 2009 and then starting to brew on a tiny test kit in August 2009. By early September they were selling beer to local pubs. Their 'two-year plan' was to be able to sell 69 barrels a week - they achieved this target within just two months! As of a fortnight ago they are now selling around 210 'firkins' a week (or '9s', the common 9 gallon casks that you see outside pubs). Also now that Cains Brewery has closed for business, Liverpool Organic are now the largest brewery in Liverpool! They use Warminster Maltings for all their grain and they buy the organic variants that they grow/source. They use Charles Faram for their hops throwing in between four and six kilos at various stages of the brewing process. In the middle of trying all of the above ales was an excellent buffet lunch consisting of a large vat of Scouse with a healthy addition of some of their Liverpool Stout, a chilli with Shipwreck IPA added as well as a ton of sandwiches, wraps, sausage rolls and pork pies. There was plenty of food for everyone so that combined with the free bar meant that the normal ticket price of £20 was definitely worth it! Last orders were around 3pm and we left around 4pm having had an excellent afternoon. I would recormend this event to anyone with even a passing interest to ale, and I'd like to thank Liverpool Organic Brewery for giving me a free ticket to the event. Of the people that I went with there is already talk of going again (they do these tours roughly every six weeks) and I'd be more than happy to pay £20 to repeat the day. A brilliant event from a brilliant brewery - if you haven't tried beers from Liverpool Organic then you are simply missing out! I totally agree, it was a great day and I have recommended taking the tour to many of my freinds and colleagues.